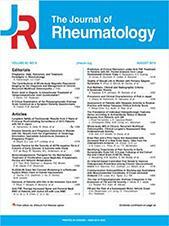 Typeset / Formats / The Journal of Rheumatology Publishing Co. Ltd. The Journal of Rheumatology Publishing Co. Ltd.
Get formatting template for your Journal Paper 100% compliant with The Journal of Rheumatology Publishing Co. Ltd. Author guidelines. Click on any Journal below to get an example of a formatted Journal Paper complete with The Journal of Rheumatology Publishing Co. Ltd. citation styles, references and mandatory research paper sections.